Not to be outdone by Gov. Bill Walker, Sen. Mia Costello‘s expected to unveil a bill to fully repeal the much maligned Senate Bill 91 at her press conference this morning. Word is the senator is spooked about next year’s election and is hoping to ride the tough-on-crime wave to reelection next year. It’ll be interesting to see just how far her proposal goes because, after all, Senate Bill 91 did increase the penalty for murder. No one familiar with Senate Bill 91 would say it’s perfect, but it seems knee jerk to blame the entire rise in crime on it when the state has a serious rise in opioid abuse, a downturn in the economy and, oh right, a deep cut to prosecutors that has lead to a third of all misdemeanors never making it to court. We’ve also noticed that Rep. Jason Grenn has been out doing his homework to understand the rise in crime in Anchorage, talking with locals and those in the criminal justice system. It’s an earnest attempt to understand the problem. He also just so happens to be in Costello’s district. Word around the Legislature is the October special session will not see the passage of a fiscal plan. The hangup? A broad-based tax. Cool, so nothing’s changed. It’s sounding like it could be a full 30 days on Senate Bill 54, which Walker added to the special session call last week. The House has the deepest lasting divisions on criminal justice with some stalwart supporters of Senate Bill 91 in key positions (Rep. Gabrielle LeDoux as Rules chair and Rep. Matt Claman as the Judiciary chair). The overall vote count, though, could give the advantage to the House Minority, which has been drumming up opposition to Senate Bill 91. There’s Rep. Andy Josephson who’s opposed Senate Bill 91 from day one, and Grenn, as we mentioned above, has been doing his homework on crime and is sympathetic to the victims of crime. That’s 20-20 right there. 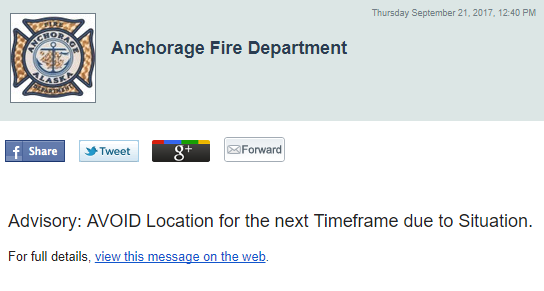 A friend of the blog sent us this alert from the Anchorage Fire Department. Guess the crime wave really is that bad. There’s been a lot of great, nice things said about the 10 or so journalists laid off from the Alaska Dispatch News (save for one really vile comment from another working journalist that came across our radar (screenshots are forever, after all)). It also appears that just about every other media outlet in Alaska is ready to scoop up that talent. KTVA is hiring for two positions. The Fairbanks Daily News-Miner has openings for an opinion editor and a copy editor. APRN is hiring a statewide news editor and producer. The Juneau Empire is looking for a cops and courts reporter. Reporters are also wanted at the Daily Sitka Sentinel, the Peninsula Clarion, the Ketchikan Daily News and the Alaska Journal of Commerce. Former Anchorage Mayor Dan Sullivan is reportedly no longer interested in joining the crowded Republican field for lieutenant governor. Instead, there’s word he’s considering a run for governor. He’s also been rumored to be considering a run for mayor again. So who really knows. Maybe he’s also Don Young’s chosen replacement? The complaint was brought by Von Imhof’s 2016 primary opponent, Jeff Landfield. The commission “found no evidence Ms. Von Imhof intended to deceive or mislead the public” so it reduced the civil penalty by 95 percent to $853.50. The penalty for failing to properly report the disclosures is $10 per day per violation, which totaled $17,070. Not exactly the most thrilling or salacious of violations, but a violation nonetheless. Apparently they wanted to know if he was so concerned about air quality why he’s also opposed regulations on air pollution from wood burning. Kudos to the kids for knowing about PM 2.5. See, young folks are not just about the THC. Plenty of distilleries throughout Alaska are dead set on continuing to serve cocktails regardless of the recent ruling by the Alcoholic Beverage Control Board. Some are just doing things as usual, others are giving you the mixers and some are rethinking what they make in house. Even though plenty have posted about the moves on social media, we don’t want to out anyone and ruin the fun. Plus, it took regulators three years to figure out what was going on in the first place. Sick and tired of those out-of-touch legislators dictating license plate designs for your vehicles? Well, grouse no longer! Voting has opened in the Alaska Artistic License competition to choose a new design to be added to the offerings of the DMV. Former Rep. Liz Vazquez has filed an open letter of intent with APOC. It’s likely that she’ll go back after the seat the she lost to Grenn in 2016. Folks in that district certainly have taken it personally that the independent won the seat and have gone to great lengths to get it back (including filing a recall petition with the Municipality of Anchorage, which happens to not be the governing body for the Alaska Legislature). Sam Cason, an independent who just so happens to live in Grenn’s district, has also filed a blank letter of intent. Also Rep. Charisse Millett has officially ceded her claim on Sen. Kevin Meyer‘s vacated seat today by officially filing to run for the House. Rep. Chris Birch, R-Anchorage, will get to leap frog the House Minority Leader on his way to the Republican primary. In 2016 Birch won his seat by a super safe margin while Millett came within fewer than 100 votes of losing her seat to Pat Higgins, who’s already filed to run again in 2018. Doesn’t everyone look like they’re having fun? Rep. Harriet Drummond has filed a letter of intent to run for reelection in the House. It gives a little more credence to the rumor that Elvi Gray-Jackson, who filed a blank letter of intent in August, may have the blessings of the powers that be to replace Berta Gardner in the Senate. There’s been no official word about the Senate Minority leader’s plans, but if she does in fact plan on leaving she’ll be missed. Rep. Bryce Edgmon has also filed to run for reelection in the House. Here’s a completely incomplete listing of political things that’ve come across our radar. KTOO is hosting forums for school board and assembly candidates on Monday, Sept. 25. at the KTOO building in downtown Juneau. School board candidates go on at 5 p.m. and assembly candidates go on at 6:15 p.m.
Up in Fairbanks, The Greater Fairbanks Chamber of Commerce will be hosting a forum for Fairbanks North Star Borough Assembly candidates from 5:30 p.m. to 7 p.m. on Sept. 26. Rep. Paul Seaton has two constituent town halls coming up. He’ll be at the Ninilchik Senior Center on Tuesday, Oct. 5 from noon to 2 p.m. He’ll be at the Homer Islands and Ocean Visitor Center later that day from 7 p.m. to 9 p.m.
Millett will be hosting a CRIME TOWNHALL at Abbott Loop Elementary School from 6:30 p.m. to 8 p.m. on Monday, Sept. 25. Reps. Matt Claman and Jason Grenn will be hosting a public safety town hall on Thursday, Oct. 19 at Kincaid Elementary from 6 p.m. to 7:30 p.m.
Up in Fairbanks, Rep. Adam Wool will be hosting a town hall over at Pike’s Waterfront Lounge from 6 p.m. to 8 p.m. on Oct. 8. Be the first to comment on "Friday in the Sun (Sept. 21): Crime wave edition"